Length of Stroke 1/4" to 1-1/4"
Fine-treated surface includes chrome-plated surface and enamel-baked surface. Surface spot nozzle, inside corner nozzle, outside corner nozzle, panel edge nozzle and rubber blasting template. The Engraving stylus is used to write on hard steel, metal, glass, stones, ceramic, plastic etc. also useful for debugging, to reshape the cut on the screwhead or broken bolts to ease removal, and naturally, to personalise tools and other equipment in the workshop. To obtain the best marketing, hold the pen near the front at sharp angle. 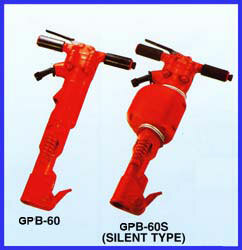 RPB-60 demolition tool is designed to deliver the power and durability necessary for a variety of construction and plant maintenance applications such as breaking heavy concrete, reinforced concrete, frozen ground, macedam boulders and pavement. Alloy steel forgings for excellent durability.